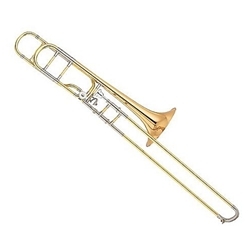 The ultimate orchestral style trombone has arrived. Xenos feature a heavier gauge brass and a thick-walled, one-piece brazed bell which has been hand-hammered thousands of times for the ultimate in a big orchestral sound. The open-wrap F section gives a free-blowing response and the entire instrument has an evenness and balance you have to experience to believe. The tone is flexible with a myriad of tonal colors, and gives you both powerful projection at fortissimo, as well as subtle control in the most delicate passages. This may well be the most expressive orchestral style trombone ever created. The hand-hammered, one piece bell has an axial (lengthwise) seam, making it a continuous extension of the instrument's material. This results in pure, uniform resonance and superior tone. The open wrap provides a more open feel and quicker response while using the F attachment. Mechanical linkage on the rotor allows for strong, smooth operation. The bell is 8 2/3" in diameter. The larger bell in combination with other design improvements, produces a singing, colorful open sound with a projecting solid core. The narrower slide tubing results in a faster slide technique, allowing the player to get around the horn easier.